Protesters have glued their hands to the floor of the Royal Bank of Scotland headquarters in the City of London. Twelve Climate Camp protesters dressed as construction workers stuck themselves to the floor while a further 100 protested outside. The activists said they were protesting against the bank's investments in fossil fuel projects. A further 15 activists staged a naked demo and climbed the roof of central London public relations firm Edelman. Climate Camp protesters also occupied the building's lobby and entrance. Edelman's clients include energy firm E.on, which owns Kingsnorth power station in Kent. Climate Camp protesters have criticised E.on's plans to build a coal-fired power station there. Subsequent Climate Camp protests took place in Trafalgar Square and at British Petroleum's central London headquarters. The campaigners, who are camping at Blackheath in south-east London until later this week, have already protested at the European Climate Exchange, Barclays Bank, the Treasury and London City Airport. Protesters at the Royal Bank of Scotland (RBS) headquarters unfurled banners stating "RBS: under new ownership" and "ethical renovation in progress". Bryony Taylor, 20, said: "It is outrageous that bankers are being given multi-million pound golden hellos from taxpayers' money while showing total disregard for the future of the planet." A spokesman for RBS said: "We are aware of the activity of Climate Camp protesters at 250 Bishopsgate. "We are liaising with the Metropolitan Police." Alice Fielding, a protester at the Edelman headquarters, said: "Edelman PR are nothing more than new coal spin doctors, intent on making profit out of E.On's activities at the expense of the global climate." 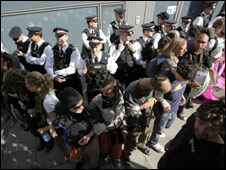 Edelmen's chief executive officer Robert Phillips said the Climate Camp protesters caused "no disruption whatsoever". "We offered them the opportunity to come and discuss the issues with us - preferably fully clothed - but they declined," he said. "Everyone all around the world is concerned about a balanced energy policy but the fact remains that someone has to keep the lights on."